In a prior post, I went over how many Christians attack evolutionary theory without either knowing what it actually is, or willfully ignoring what it actually is. I pointed out that many Christians, including the pastor who wrote these things, try to make false claims about its supposed randomness, which he, and they, think is such a great and wonderful attack on the theory that they benefit from every day. The pastor posted two posts on his blog, in an evident hope to support his claims. Let’s see how he does. To begin with, he tries to excuse his claims by saying that the average person uses the terms accident or chance. That may the case; it’s still wrong, and creationists use these terms intentionally to try to cast doubt on evolutionary theory. The pastor just parrots what they say and these creationists certainly do their best to hide behind science when they want, witness the attempts by the Discovery Institute, Answers in Genesis, etc. when they try to claim how ever-so scientific they are, insisting that any second now, they’ll have actual evidence for their myths. It’s been decades since they’ve made that claim and still no evidence. There is no evidence that the universe came about by accident or chance. Indeed, the evidence points to the laws physics being quite enough for it to come into being and they may be just as “eternal” as theists claim their gods are. The pastor displays his ignorance about other religions when he repeats his failed claim that “people saw this world as being the by-product of the wars and love affairs of gods”. Some religions do indeed see this as true, and quite a few make the same claim that the pastor does “Creation reveals God and leaves us without excuse.” None of them can support this, and putting the words in bold doesn’t make it any truer and no better than the claim of an imam or a guru or a Wiccan priestess. He also claims that the gods of other religions didn’t mean to make the universe and humans. That is incorrect too and that ignorance would have been cured by a very quick internet search. For example, Ahura Mazda was an uncreated being that intentionally created humans as a good thing. Jainism believes that the universe has always existed, no creator needed. Egyptian myth has Ptah creating the universe with a “word” and speaking humans into existence or Neith wove everything in the universe intentionally on her loom. When one cherry picks myths, one gets a wrong answer that all religions have what Christians often seem to be trying to make as a set of “primitive” beliefs. In other religions, there are indeed purposeful creation of human beings. The pastor’s claim that humans are only a “by product” in other religions is wrong. It doesn’t seem that creationism and the pastor’s version are getting off to a good start. His idea that humans *must* be created by a god intentionally doesn’t make his religion unique nor does it support the common Christian claim that humans have to be created to be worth something. Per his religion, we must worship his god because his god created us to do so. That no evidence can be shown to support this claim, there is no need of worship (and paying preachers) at all. The pastor claims that there can’t be reason or purpose for his existence without his god. I do feel sorry for people who feel like that since that makes them afraid, very afraid and very dangerous to people who dare to point out that they can be wrong. When one’s entire self-worth is based on being right about a god that has no evidence for it, it can make for desperation. I would posit that this desperation is why a lot of young men and women kill themselves (and others) for Islam. They have nothing else that tells them that they are worth something. Happily, humans can have many things that make life worth living, which gives a reason and a purpose: family, friends, pets, justice, art, etc. The pastor, like so many ignorant Christians, wants to claim that having no god means nihilism. They have to make that false claim since they have to be able to give a reason why someone must agree with them in order to get that external validation. They must play on fear. Things still aren’t looking good for this Christian version. The pastor’s quotes from Dawkins are a little strange. They do show that evolution is not based on randomness as creationists would claim. They are all from Climbing Mount Improbable and the main gist of this book is that evolution isn’t improbable like theists may claim since it does things slowly, makes many mistakes, and doesn’t always work or get the best answer to a problem. We can see that if we take one of the bits and look at it in context. The pastor claims that there are three problems. That the defenders of evolution have not allowed for the use of everyday language to sum up a point or to describe the perception that arises out of their theory. That a lot of people don’t really know how things like chance and probability work. That whilst it would be reductionist to think of evolution purely in terms of random/blind chance, it would be similarly reductionist to ignore the element of chance present in evolutionary theory as well. It is not that the “defenders of evolution” haven’t allowed for the use of everyday language, it is that we aren’t interested in the false claims of creationists being spread by their ignorance of the subject they attack. It is true that many people don’t know how probability works and that includes creationist. I’ve found this website that does a good job at simply explaining probability. And yes, we know that the pastor is using “accident” and “random” as attacks against evolutionary theory since the creationist’s only argument is that the universe must be designed and must be intentional. Creationists try to use the ignorance of others about chance and probability to make their false statements. The last point is a strawman since no one has said that no chance at all is in involved. The only ones who have tried to imply that evolution depends entirely on chance are the creationists since, again, they must draw a distinction between their divine design and everything else. Varying probabilities are involved and one can see that from the quote from Dawkins above. (as an aside, probabilities are something that a lot of folks don’t understand. The probability of life on earth is 1 (certain) since we are most definitely here. We don’t know exactly how things started, and we may never know, but we know it happened. The evidence may be long gone since the surface of the earth is constantly being remade. So, for abiogenesis we don’t know exactly how it started, but we know the laws of physics and chemistry so we can do the experiments to get ideas on how it may have worked. We may, at some point, succeed in making life, but even then we may not have come upon the exact way it happened on earth because there could be more than one way for abiogenesis to occur. Now, we have plenty of evidence that evolution has occurred. We have evidence that there are physical laws and they don’t change randomly. We have physicists that propose theories and we have the experiments and observations that these theories are accurate descriptions of how the universe behaves. This makes for a high probability that they are correct. It’s rather fun to watch creationists now try to walk back their false claims about evolution. This has happened again and again since evolutionary theory was mentioned. By dribs and drabs, creationists have accepted the pieces of evolutionary theory that they could not reject without looking completely idiotic. 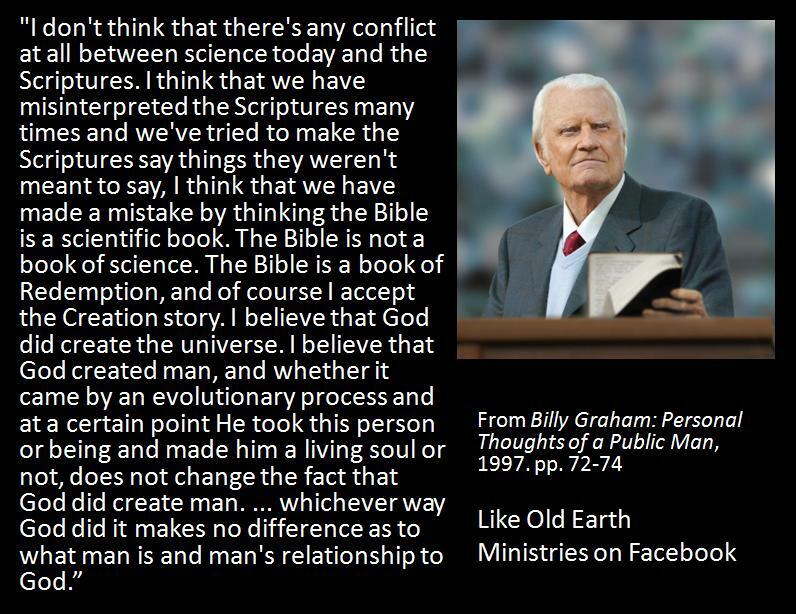 Oh well, the bible was literal….. until it became metaphor. There was no evolution….until some creationists decided that that there was “microevolution” but golly, no macroevolution. And now we have Christians who say that the bible has nothing to do with describing the world as it is, but not it’s only a guide for morality and spirituality (which it fails at too). Now, the pastor wants to claim that we are “really” talking about probability. And indeed, we have been all along. In this universe, we know that everything isn’t random and chaotic, which is exactly what evolutionary theory says and how the world works. However, when a theist claims a miracle, and that the events of the bible really did happen, then they are claiming that yes, “anything can happen”, that people can fly against the laws of physics, that a whale can swallow a man, that the dead can be made alive again, the universe is random and chaotic. However, they don’t live their lives this way. They claim that they have a god that is the “unknown known” that makes miracles happen, but they have no evidence for the actor nor the miracles themselves; they inject the deus ex machina which they cannot show exists or that it is even probable. It’s no surprise that the pastor quotes Dawkins when Dawkins is describing how improbable the molecule’s formation was, but surprise, doesn’t quote the next part where he explains how this happens. Note that Dawkins is talking about what is improbable in the life time of a man, not in the billions of years that the universe has existed (of course the pastor doesn’t likely believe in this fact either). Now one can see what Dawkins continued on with here where he indicates that this “accident” isn’t so much of an accident at all, not the way creationists try to use “accident” and “random chance”. Indeed, but since the pastor has yet to prove something can’t happen, all we have is a god of the gaps argument. The pastor’s next “reasons” fail for the usual reasons: the theist is ignorant of what he argues against and tries to create strawmen evolutionists. Evolutionists do not ignore chance. They also know that the laws of physics work and don’t magically change. The pastor is attacking a strawman he has built. I’m sure that the pastor might be worried about reading probability backward in that it shows his baseless claims aren’t true. For someone who is supposedly so concerned about probability, he never addresses the probability of his god existing at all, much less doing what is claimed and has no evidence for. Probability isn’t “only” for prediction; if we don’t know exactly what happened in the past, we can use probability to consider the probabilities of what may have happened. To claim demonstrates quite a bit of ignorance or a desire to misrepresent it since it does not help the pastor’s case. His argument from personal incredulity is nothing to be respected in any case. His last argument is ridiculous. He wants to claim so many things about probability but in the end, when he has nothing else, it just comes down to his baseless claim that his god is required to provide meaning in this universe. It’s nothing more than the appeal to fear, a command to remain ignorant lest you lose your “meaning”. Sorry, but the rest of us have reason to be here and we don’t have to have a tyrant that we must worship to give us meaning. And if his bible is to be believed, plenty of people were put here by his god to be just a “by-product”, the pots that the potter can just destroy for no reason other than its vanity. As for his stories about himself at the end and in his part 2, well, it wasn’t “random and chaotic”. His mum didn’t’ appear from thin air. He didn’t turn out with lavender hair, nor did he turn out to have magical powers to fly or shoot lasers from his eyes. He was made aware of certain things in the world and didn’t know at all about things that were in some little village in India. He couldn’t’ have been an astronaut since they don’t hire the nearsighted. Two Christians being introduced by other Christians and marrying is not improbable at all and was not “random chance”. Since physical laws are a certain way, it wasn’t “random chance” that chemicals joined because that is what they do thanks to those laws. He *is* just a cluster of atoms, that happens to have self-awareness and consciousness, the sum of his parts and experiences. There is nothing impossible or improbable about his existence. And to claim that he is an “accidental by-product of chance” is again wrong. He can’t have his “everyday” way of referring to probability and then require more for evolutionary theory. That’s the common hypocrisy of so many theists when it comes to the sciences. They must do all they can to declare how special they are, that they are the chosen of some god, and that they and only they have the right way to worship it. The bible may say different, but that doesn’t make it right. It also says that bats are birds, that the city of Tyre can’t be found by anyone anymore, and that JC was going to return to create the kingdom of god on earth when some of the people supposedly staring at him were still alive. Those haven’t worked out so well. Previous Post Not So Polite Dinner Conversation – what makes Christianity Christianity? What I find remarkable is that people who know next to nothing about some scientific idea decide right off the bat that the idea must be wrong because it offers some conflict with another opinion currently held. 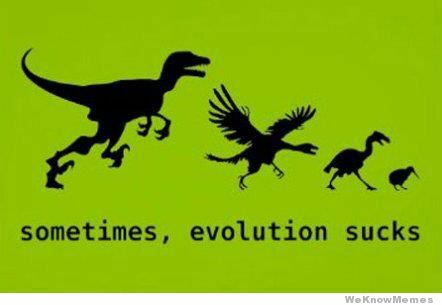 This is true, of course, with creationism. What is remarkable is the level of arrogance and hubris to assume – and this is exactly what creationists must do to proceed down the faith-based belief path – that the science is wrong and then think they themselves have the wherewithal to then ‘explain’ to others why this is so. That approach in itself is a demonstration of idiocy, a great big red flag that the following explanation is going to be of zero knowledge value but full to the brim with ignorance, stupidity, and egotistical zeal. That’s why arguing with creationists itself is an exercise in futility: the scientific side in the analogous soccer match between science and religion has no opposing goal into which they can score any points and, by rule, are not allowed to touch the faith-based ball. it largely is an exercise in futility. But I still find it worthwhile even if as just a writing exercise. Tru-dat. Nothing clarifies ideas better than having to teach it. But it explains why the guy’s web site doesn’t accept comments: informed comments would be fatal to his thesis and reveal the depth of dishonesty needed to promote creationism. If ever asked “why is there somehting rather than nohting?” simply reply, there was never nothing. If the theist believes their god can be aseitic, then I believe the universe is aseitic. We have, after all, evidence the universe exists, and presently we only understand 4.6% of it.